Definition at line 15 of file Mutex.h. Definition at line 18 of file Mutex.h. Definition at line 37 of file Mutex.h. 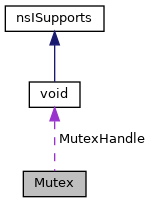 Definition at line 66 of file Mutex.h. Definition at line 43 of file Mutex.h. Referenced by Defragment::Lock(), and ~Mutex(). Definition at line 72 of file Mutex.h. Referenced by Lock(), Mutex(), and Unlock(). Definition at line 74 of file Mutex.h. Referenced by IsLocked(), Lock(), Mutex(), and Unlock(). Definition at line 73 of file Mutex.h. Referenced by Lock(), Mutex(), Unlock(), and ~Mutex().